Let say you get lucky and you have your unit in order, you will need the controller to run this brick. Most of the guys are using Dave - WW2R design. What yo need to know is that you have to multiply the required output synthesizer frequency by 3 and edit the ASM code just using the first 4 digits, compile the HEX and program the PIC 12F675. Plug the power and the lock LED should blink once and lighted. BINGO. This happens if all is going by the book. So you need to program the ASM two lines with the 3540. Of course, the Dave HW is supporting two frequencies, so program another convenient one. Well, do not expect to have the units working out of the indicated range. Many guys are looking to have the DFS-1201 running on 12.023.333 MHz (for the 24GHz beacon) but mine experience is that the units can lock from 11.250-11.860 MHz, so even narrower than declared. Simple as beans soup :-) The VCO is running on 2.8-3.0 GHz. 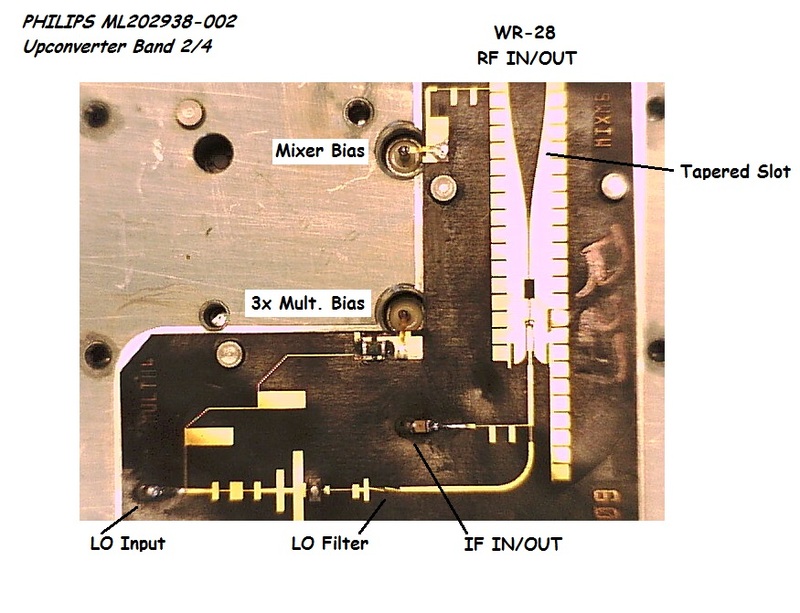 There is a buffer right after followed by the resistor splitter for the PLL and MMIC doubler 5.6-6 GHz. There is a high pass filter and another 6Ghz MMIC amplifier to provide enough power to drive the x2 multiplier diode. A long 12GHz filter then is followed by 2 stage FET amplifier. The total multiplication factor is 4. Clear ? Guys owing the Alcatel White box 23GHz equipment needs the oscillator running on 5.9GHz. This is not so common surplus e-bay unit. DFS-1201 can do that ! 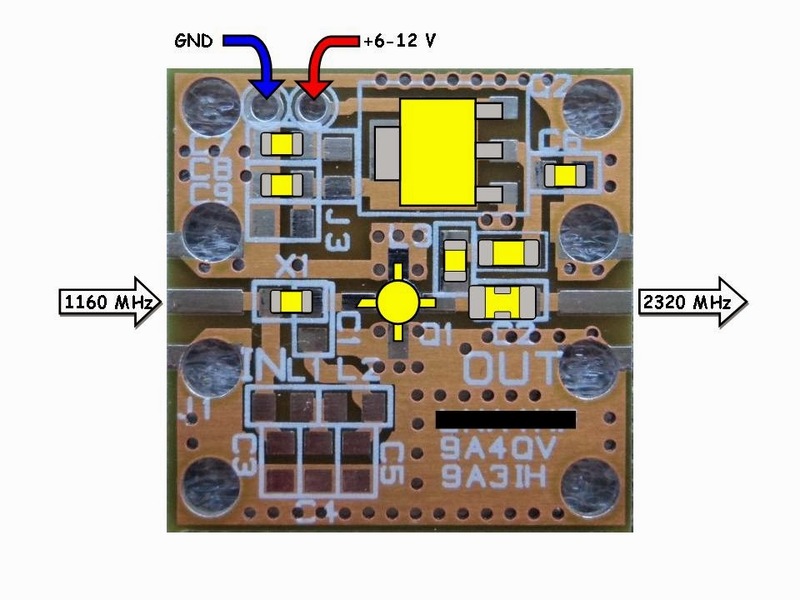 All you need to do is to run the 6GHz signal from the amplifier just before the diode doubler to the output SMA connector with a peace of semirigid coax placed where the diode multiplier, 12GHz filter and 2 stage amplifier sits. 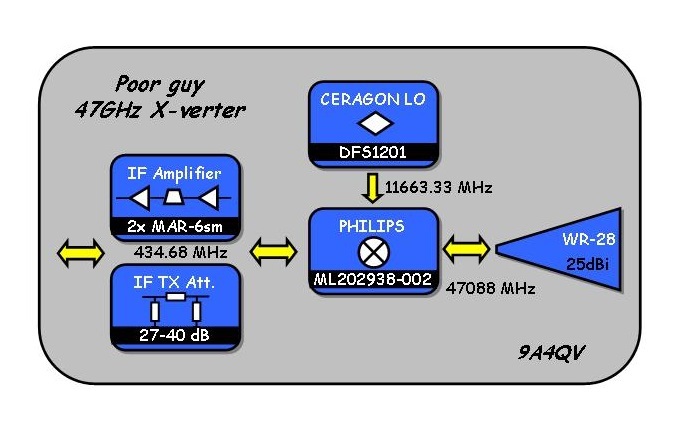 All this multipliers and amplifiers (except tha last 12Ghz stage) are Sirenza S1 and S2 (ERA-1 and ERA-2 mmics) so you will have more than enough power for your White box 24Ghz transverter. I did not play around the PLL side so much, but briefly, the reference oscillator is running on 100 MHz and heated as per above picture. The signal is then multiplied by x9 and filtered with two ceramic filters. Another mmic multiplier by x3 using INA10386 mmic followed by 2.7Ghz hairpin filter. This signal is then going to the mixer on one side and the signal from the VCO from the other side and we have the mixer output of 100-300 Mhz going to the lowpass filter and then after to the PLL. The complete picture of the digital part is here. Most common problem is that the frequency is odd. Of course, aging of the crystal with the constant temperature is resulting to have the output frequency shifted (in my case 23khz @ 12Ghz). Just above the crystal there is a small part looking as the trimmer capacitor, so this may be re-tuned, I think so. I had some other problem, when cold, the unit lock properly, but after some time when heated, if the unit is switched on/off I can not get the lock state and no output at all. This remain to be investigated. On some DFS-1301 unit I can not get the lock state at all, even when cold. Checked the VCO control voltage from the charge pump and the 6V measured. It should be 5V. After playing around VCO transistor (marked 420) i manage to get the lock, VCO control voltage drop to 5V. After restarting the same problem. This should be also investigated. And yes, to run the DFS-1301 from the Dave board, the output frequency should be multiplied by 2 or divided by 5. Funny math, you get the same first for digits :-) to program the ASM code. For some time there was no new post from me, but here is the one that can be handy and interesting. I will try to bring your attention on this peace oh the "aluminum brick" called Eyal Gal transceiver. If you have one or if you are planing to buy one then you already have the G8CUB paper about it and the basics about building the 24GHz transverter. Buying the Eyal Gal transceiver unit is just a half way to a working transverter, maybe not even a half way, let say 40%. I learn that on my unit, so be prepared to some extra sacrifices :-) and hiding the money from your wife :-) I will try not to repeat the good Roger Ray G8CUB article about this unit. Instead of that I will try to present my itinerary and the way how I made this thing to transmit. I obtain my unit (two units) from the "24GHz microwave store" owned by a really BIG gentleman Ernie -HG5ED. It was a big gift from a big guy like he is. He knew that this is just a half of the story, so he included the local oscillator to drive this wild machine. Yes, you need the external local oscillator too, so start saving the money.... The local oscillator should work on the half frequency and what is required is the high side injection. As I choose the 70cm IF, the local oscillator should run on 12240MHz. This can be done using the various techniques, from the endless multipliers chain to the expensive low phase noise oscillators. My local oscillator is the CDFS-1295, ELCOM-Ceragon unit that can be found from time to time on the E-bay. More likely you will find the DFS1201 Ceragon unit that can operate from 11-12Ghz which is not good for this radio, we need the 1295 model running from 12-13Ghz. Whatever, you need the 10dBm @ 12240MHz signal. If you plan to use the Ceragon LO's then you need also the controller to run this unit. The controller can be found around the web together with the software for the PIC. OK, so you have the transceiver, the local oscillator and now you need the descent power supply for the Eyal Gal unit. As you already know, +8V, +12V and -12V are required for this unit. I start to make the first test with the old PC power supply where +/-12V is available and +8V was produced with a single 7808 voltage regulator. This can work, but if you plan to run your transverter portable on the car battery then the PC power supply is not a good option.The tricky part is obtaining -12V and 120mA. For that purpose I use the DC/DC converter (thanks to Ernie) where I have the +/-12V and 250mA output which should be more than enough for the negative supply. The positive 12V is obtained from the 12V rail external power supply or the battery. Another tricky part may be the +8V where the consumption may reach over 1A in TX. This can be solved with the switching units. To make things simple, I use two 7808 regulators in parallel with the diode on the output. All the voltage regulators are fixed to the good heatsink. So beside the L.O. delivering 10dbm you need a IF radio delivering -21dbm for the proper mixing. Of course, the attenuators are used. Take care, if you ran the IF radio with 2w of output you need 54dB of attenuation on 70cm which is not a trivial. If you used the relay for switching, it should be a good one, with the good isolation. Instead of that, I use the old fashioned switching with the PIN diodes. It is true that also on the RX side I have something about 5db of attenuation, I cure the problem with an extra MMIC amplifier in the RX side of IF switching unit. Of course, I was faced then with the extra gain and s-meter showing S-2. Then extra attenuator was introduced, which is not bad idea as the mmic see the nice 50ohms on input/output. The Eyal-Gal unit is a transceiver and not so much to switch around it. To make a story short, you need to key only PIN 1 and all the rest of the pins you can leave n/c. Pin 1 is described as TX inhibit pin. It mean that you need to ground this pin when on RX and lift up when on TX. This will result better reception and less current consumption that leads to less heating of the Eyal-Gal at the end. So do not forget, PIN 1 to GND when on RX. Pin 6 is a output power detector, where you can see by the DC voltage if you have the output power. I measure a bit more than 3V DC on that pin when on TX. Do not expect the voltage following the modulation! You will have constant (more or less) DC voltage as there is the 2xLO signal and both mixing products measured. This is why you need a filter on the TX output side ! Pin 7 is the RX AGC control. Well it works the same way like the pin 5, if n/c you will have the highest RX gain, if 0-5V dc applied you can reduce the RX gain. The output filter on the TX side is a MUST. Do not operate the transceiver without it because you may interfere with some cell tower links. You do not want to do that. You will have to look for a experience microwave guy help here or buy the tuned filter for the desired frequency. You probably heard the stories that antenna relay for the 24GHz operation should be a waveguide switch and nothing else... So why there are SMA coaxial relays on the market rated to operate up to 26.5GHz ? The E-bay is good source of such relays with a fair prices. More over the latching relay type can be purchased really cheap. Using the SMA relay will save you a troubles bending the waveguides, using the flexible waveguide and at the end the waveguide switch is really expensive. So the SMA coaxial relay is not only a cheaper but occupy less space and the box can be smaller, which also reduce the final cost of the transverter. I did not measure the difference and the losses, but messing with the waveguide switch comparing to the SMA relay is not worth money and time. Even the desk measurements on the instrumens were OK, the real test was performed listening the live signal on the band. Observe the frequency stability of the Eyal Gal transverter and the Mini beacon running some 4km away. The mini beacon will be explained in the next article. Note: none of the units were conected to the GPSDO reference. At the end, what can be done with the 24GHz transverter described, so far I made the 236km QSO in a not so good conditions, means humidity 60%, temp 17 degC and pressure 1016hPa. The antenna used was a "footer" 32cm dish. The qso was a SSB with a solid copy both sides. Well, do not forget to switch the LSB on your radio when operating USB due to high side mixing. The drawback is that the tuning the frequency is opposite, but this should not be a problem for a experienced microwave operator. After successful testing of NOTARS-C band transverter for the 3400 MHz it was just a matter of time to do the same with the transverter for the S band. It means this transverter can be used on all 13cm bands world wide 2304 MHz, 2320 MHz, 2401 MHz etc... It can be used also as the S53MV NBP ( Non-Flawless Protocol) transverter for up converting the 70cm band to 13 cm or 9 cm ( using the NOTARS-C ) Low side or high side L.O. injection - it does not matter until we use the 70cm band for the I.F. The beer bottle caps are not the part of the project, they are here just to give you the idea of the transverter size. Maybe this beer caps are good for filters up on the 6cm band but not here :-) This is the prof of project board and the final PCB should be even smaller, there is a plenty room for the resizing making everything working the same on less FR-4 substrate. There is a short video showing the reception from the other 13cm transverter using just a Wi-Fi vip antenna. It can be noted that the frequency stability is quite OK. For the L.O. in the video I am using Si-4133 synthesizer running at 1888 Mhz requiring 432 Mhz for the I.F. for the successfully operation on the 2320 MHz what became a standard in the Europe. For other 13cm band plans scheme just drive the other L.O. frequency. The other side 13cm transverter (transmitting on the video) is using a crystal oscillator with the multiplier to reach the desired L.O. frequency. after a couple of minutes, the stability was also good. The transmitting part is working also nice, producing more then 18dBm (70mW) of power on 2320 Mhz. This can be enough for rover type operation with the standard Wi-Fi antenna. A small sequencer with the power attenuator and you are ready to go. The on board filters are reducing the unwanted mixer products and L.O. signal almost 50dBc without any external filter. The twins from the picture are ready for the operation. For a moment we will stop here, NOTARS for 5760Mhz is not yet ready. As I required some descent L.O. signal for my NOTARS-C transverter the easiest way was to use my Si-4133 synthesizer. 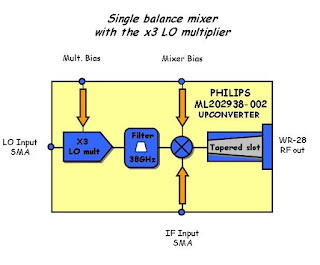 The upper limit for the synthesizer is roughly 2 GHz so some kind of a simple multiplier was required. No tune multiplier as a solution can be handy (same approach as 5.7GHz multiplier) but then I will be constrained to narrow selection of L.O frequencies. Possibility to tune to various frequencies was much better cause I want to test my NOTARS-C using both, high and low side injection with IF on 144 and 432 MHz. Between several possibility, the pipe cap filter was a "best buy" option. Simple, cheap, easy to tune and not taking so much time to fabricate one. Looking around the "acid house" i found some 3/4 pipe caps from some previous projects, so this was easy to pick up. Dead bug style is no option on microwave frequencies, so some kind of PCB is a must. Luckily I have a pile of commercial equipment PCBs where a piece was striped of with a 50ohm microstrip line. X-acto knife and a little bit of imagination and the PCB was ready. Not nice and tidy but sufficient for the quick and dirty project. 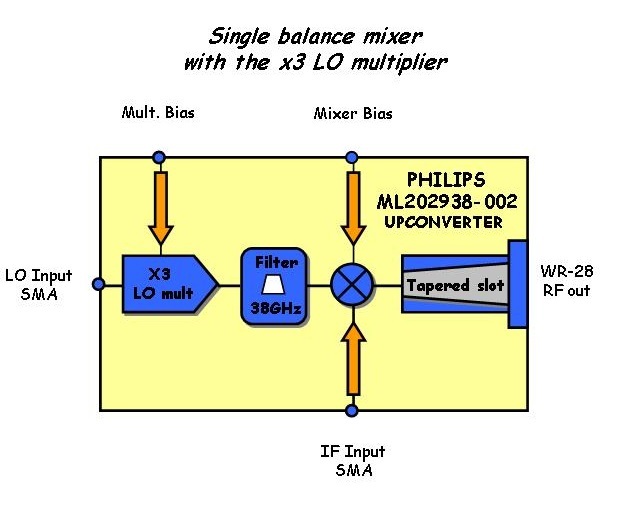 The multiplier was built around two MMIC amplifiers. The first SNA-286 is running as a multiplier and the second one, ERA-5 is running as amplifier. Of course, some other MMIC can be used instead, but it is wise to use the MMICs that are working on the frequencies of interest. In my case, both MMICs are good up to 6 GHz so there should be no problem at C band at all. To force the first MMIC to act as a multiplier it is essential to saturate the MMIC just enough to produce reach harmonics. Do not push higher than maximum input power is allowed according the data sheet (dBm). I found that levels from 4-5dBm are working very good for this purposes. The higher input level will not always insure the higher output on desired harmonic frequency. Same goes for the Rb bias resistor. Increasing the value over the 80 ohm can give as a higher output level on desired harmonics too. This should be found by experiment. Do not go lower than 80 ohms because this Rb value will insure the highest allowed bias current. I found 100 ohms value to be handy for all frequencies from 2 up to 7 GHz. After filtering the required harmonic frequency with the pipe cap filter the signal is amplified with the second MMIC, ERA-5 which produce high and stable gain up to 6 Ghz. The output at 3836 Mhz was 17.6 dBm in my case, more then expected. The pipe cap construction was straightforward. There is not much to explain, the design is quite simple. The dimensions of 3/4" are standard. In Europe they are sold under marking "22". I found the type "Vieaga 22" 22 stands for inner pipe cap diameter in mm. Inner height is 18 mm. For probes I used simple copper wire, 0.6 mm dia. Length inside the pipe cap was 8 mm and the distance between the probes was 12.7 mm. 3/4" pipe cap will give us the possibility to tune the filter from 2 up to 7 Ghz roughly. The peak on 3896 MHz was very strong and easily found, tuned with the M4 screw. Pipe cap filter was a good choice. The signal was clean on required frequency. At the same time the attenuation was enough on the higher harmonics not to cause any problems. Tuning around the C-band was really easy and not sharp making no problem to distinguish the 144 and 432 Mhz IF frequency. Tuning on higher harmonics other then 2nd was also easy. I manage to tune the filter even on the 4th harmonic, of course with the reduced output, but still usable and clean signal. After all, the multiplier came out as small and handy solution. This one will probably end up as a small C-band beacon. The only thing that men are fighting about the smaller one is the mobile phone. Well, not just the mobile phone, but also we can say, the transverter. Everybody is looking for the smaller and better. You may ask why NOTARS ? NO Tune And Really Small - C band transverter. Easy and simple, plug and pray solution. No tuning parts, no expensive laminate, fixed filters, simple layout. Of course, it can be even smaller by using 0603 instead of 0805 SMD parts but do we need such a small transverter ?